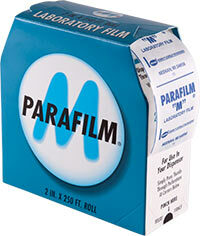 Parafilm M, laboratory sealing film, is waterproof, stretchable, moldable, colourless and self-adhering. It is a versatile protection film that provide moisture barrier to culture media yet it is gas-permeable. It is popular in the laboratory because of its moldability that offers flexibility to seal various objects and apparatus with irregular surfaces and openings. In a less known yet common field, it is widely used for organic fresh-cut produce. It is used to control ripening and therefore protect the fresh cut produce from fast deterioration. 1. The film is not suitable for use with chlorinated, non-polar alphatic and aromatic solvents.